Whether you’re throwing a corporate dinner or planning your wedding reception, the food is always an important element in the planning process. And once the main course is over, most of your guests will be ready for something a little sweeter. When you’re planning out the menu for your next event, don’t forget about the dessert options! Cookie trays and traditional sheet cakes are a thing of the past (of course we still love a good traditional cookie, don’t get us wrong!). In today’s party trends, catering menus are often focused on meeting interactive with traditional done in a modern way. Meaning, instead of a single style cake at a wedding, many folks are planning their dessert bar with multiple cakes and other dessert options – such as pies, candies and even donuts! Today, we’re discussing some great dessert ideas for your next catered event – small or large. And make sure to have something sweet around, you’ll want it after reading this list! First, let’s go over some of the trends in the cake world. You don’t have to have a wedding to have a great cake. Many people purchase cakes designed for birthday parties, baby showers, and bat mitzvahs. And most of the time, they’re not buying just one cake for their event. Skip the icing – naked cakes are all the rage. Basically, icing between all the delicious fluffy layers of cake, but not on the top or sides of the cake. This leaves an unfinished, or “naked”, look to the cake. But it definitely looks good. Going for a naked cake at your next wedding or baby shower can be a big hit. The simplicity of the look allows you to add your own decor – such as flower blooms or mixed berries around the base of each layer. Many wedding dessert tables offer more than one kind of cake – and sometimes more than one style of cake altogether. Don’t be afraid to mix it up a bit and offer a variety of cake flavors and looks to give your dessert table some pizzaz. Shy away from the traditional look of a single, five-tier cake and opt for four or five cakes of 1-3 tiers each! You can even offer more than just cake. Mixing in other types of desserts, such as cupcakes or pies, will give your guests even more options for choosing their favorite sweet treat. Creating a dessert bar or dessert buffet is a fun way to mix up the variety and potentially even save you a little cash on your event budget. Offering a variety of desserts (such as the cakes we mentioned above) not only offers your guests more options, but you can also make it more special for guests by including desserts you know they love. Like having an option for lemon squares because they are your grandmother’s favorite. Or including a single German chocolate cake because your mom makes it for your birthday every single year. It can be a great and sentimental way to bring your guests closer and create a memorable dessert option on your menu. Creating a themed dessert bar is also a great idea. Do you love to visit the French countryside? Perhaps a dessert bar full of French-inspired pastries – or pâtisserie – is the way to go. Or if your wedding theme is Southern-traditional, some good old-fashioned pecan and chocolate chess pies are a great addition. And for the cookie lovers – offer multiple types of cookies! There are tons of great flavors and a variety of ways to do them (think chocolate dipped or powdered-sugar-coated cookies). And don’t forget to also add in some beverages to go with the treats, such as some ice cold milk or a coffee bar. One trend happening for the morning pastry lover is the donut bar. Many people love donuts but don’t often think of them as an after-dinner treat. Offering donuts can be a fun way to steer clear of the traditional cake or pie. And since donuts come in all shapes and flavors, your guests should have no problem finding an option they love. 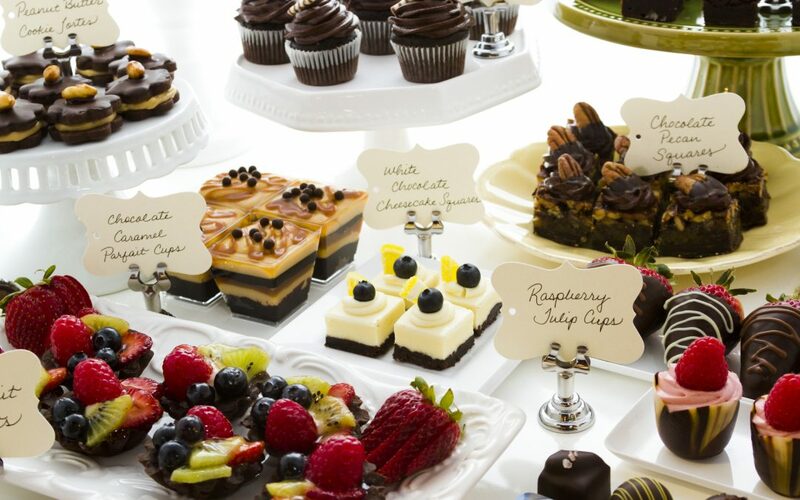 What could be more memorable than having an interactive dessert station at your next event? Interactive stations offer an activity for your guests, along with customization to their own after dinner delights. In the fall, a s’mores station near a bonfire is a great way to bring folks together after the dinner portion of your wedding reception. You caterer can set up an area where guests can choose their favorite s’mores combinations, such as milk or dark chocolate or plain or cinnamon graham crackers! Fondu stations are also a great idea. You can even set up more than one so that guests can spread out a little. Make sure to ask for a variety of options for dipping! Cake bites, fruit bites, and even saltier snacks like soft pretzel bites are great for dipping into chocolate and caramel sauces. The summer months call for ice cream – so why not offer an ice cream station? Guests can choose their favorite ice cream flavor and then top with whatever they like. Candies, sprinkles, syrups, fruits – the options here are endless. And if you’ve got kids at your event this dessert bar is sure to be a hit. A crepe station is another great interactive dessert station idea for your next catered event. Your guests can request the caterer to fill their very own crepe with the toppings of their choosing – like strawberries and Nutella or honey and bananas. All the rage these days is single-serving desserts made in small sizes. Mini desserts can be literally any type of dessert made smaller to give your guests both an option to taste more types of desserts without feeling guilty and also the ease of grab and go at the dessert bar. Many different cakes and pies can be made in tiny forms. Even little boats of custards, parfaits, and cobblers can be presented as a mini dessert. We’ve all heard of mini cupcakes, but how about mini pies or even mini bundt cakes? Super cute and super tasty, you can practically go in any direction when adding tiny sweets to your event catering menu. Another mini dessert idea is to put ‘em on a stick. Literally – have your caterer create “pops” out of your favorite desserts. You can really go anywhere with this one – from cake pops to mini pies on a stick. Dessert pops are also a great way to save on plates and forks. There are countless possibilities for you to mix it up a bit on the dessert menu at your next party. Let us know if you’d like to try something new or put a twist on something traditional and we’ll be happy to help. Call us at 720-838-0781 for your next Denver-area catered event!